Belarc Advisor is one of my favorite free system information tools. It's fast, easy to use, and gives you a surprisingly digestible report of what makes up your computer system. One popular category that Belarc Advisor excels at is providing software license information. In fact, it's so good at finding the correct product key or serial number for your installed programs that the program also tops our list of free product key finders! This review is of Belarc Advisor v9.0. Please let me know if Belarc, Inc. has released a newer version and I haven't yet reviewed the update. Similar to other system information programs, Belarc Advisor gathers information regarding things like any software installation, video card, CPU, RAM, software update, as well as motherboard and network information. Belarc Advisor works on 64-bit and 32-bit versions of Windows 10, Windows 8 (including Windows 8.1), Windows 7, Windows Vista, and Windows XP. Current server and older consumer Windows operating systems are supported as well including Windows Server 2012, 2008 R2, 2008, and 2003, plus Windows NT, Me, 98, and 95. See the What Belarc Advisor Identifies section at the bottom of this review for all the details on the hardware and operating system information you can expect to learn about your computer using Belarc Advisor. I really like Belarc Advisor and I've been using it for a long time. I'd consider it the "original" system information program. I'm not aware of any similar program that's been available and continuously improved upon, for anywhere near the length of time that Belarc Advisor has been. I used it way back in the Windows 95 days! Obviously, it's great that it's a completely free program but that's not at all why I love it so much. Belarc Advisor is quick, accurate, and produces more detailed information that many similar programs, some of which dare to charge for a similar feature set. If you're in need of a program that can quickly and accurately produce detailed information about your computer, Belarc Advisor is an excellent choice. I'd also recommend that you use Belarc Advisor for any product key finding needs you might have, especially for Microsoft Windows and Microsoft Office licenses. 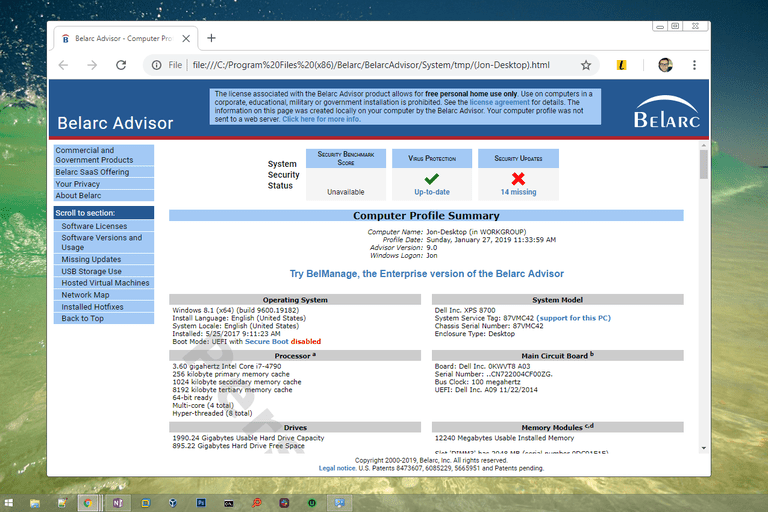 There are a few user reviews of Belarc Advisor that suggest that the program doesn't find the proper Windows product key, but please know that these aren't real issues with this tool but are instead unfortunate results of specific Windows setups. See Key Finder Programs FAQ for more on why a key finder might show B's for a product key or why you might find the same key on two or more different computers.